Do you enjoy events/activities? We have an opportunity for you! We offer activities for our clients on a monthly basis and are looking for volunteers to assist our program team during each activity. Typical assignment commitment is 3 hours, including set up and clean up. We also have approximately 3-4 event opportunities that are connected to fundraising initiatives. These assignments vary in time commitment. Volunteers serving in the role of an activity and/or events volunteer are responsible for assisting with the implementation of one or more assignment. After completing the application process, volunteers will be regularly presented information about potential assignment opportunities. Volunteers sign up for an activity or event based upon their interest/availability and number of people needed to fulfill each assignment. Assignments are made on a one-time or ongoing basis, as per the interest of the activities & events volunteer. 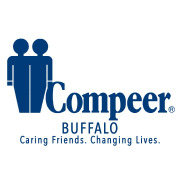 Contact the Director of Volunteer Engagement at lisa@compeerbuffalo.org or (716) 883-3331 X312, to discuss opportunities for individuals or groups! Varies depending upon assignment, average time for one assignment is 3 hours.